General mods that are considered worth doing; regardless of the end firmware you use. I wanted to flash my 9X V2 with er9X so I soldered 6 pin ISP on mainboard. I also short the output diode because I wanted to use battery power on external device. After that, it doesn't want to start, nothing happen no bip no light....I desoldered 6 pin...the same....I check all µc output for short, it is , I checked power 5V is OK at all entries, I just notice 7805 and µc to be warm after few seconds. Really don't know what happened , I decided to change the µC so desoldered it and soldered a new one, I flashed directly er9X.hex via studio 4 ... and the same. I tried to find new main board but 9XR is the only available and it does not fit. Thanks very much if you have idea, I can try anything I have nothing to loose. I am also ready to try to adapt a 9xr board if I can have support on how to do it. We have helped many to get their boards back working so hang in there. If you can flash the processor then we should be able to get you back running. With the new uC, did you set the fuses? When the processor runs er9x, the first thing it does is configure the internal pullup resistors on the switches and buttons. With a meter, check the voltage on the EXIT button. It should be 5V, changeing to 0V when you press the button. Too bad. I guess the postage round trip would be more than a new 9x? Thanks for your messages, yes I'm from France Versailles so a bit far from US. You are right I think I would not pay more 20$ in parts as it would be more interesting to get a new tx. Thanks MikeB for your support, regarding fuses I didn't find what to put so I left original maybe it was a mistake, if you have it I can load it ? I'll also check switches voltage to know if er9x starts. I use STK500 with studio4. I put your fuses and load again er9X, it is the same. I checked 5V at switches there is no voltage at all. So atmega doesn't start ? but why ? After flashing, do you do a verify? I ask because I also use a STK500 for programming and I found it would no program reliably unless I reduced the programming clock to quite slow. This is because of 0.1uF capacitors on the end of 200 ohm resistors on the programming signals and the STK500 doesn't drive the signals very strongly. I built myself a high drive buffer unit so I could program at high speed. If the verify is OK, next check the reset signal is going high. Programming is done with it low, so if it is stuck low you will be able to program, but the processor will not run. Studio 4 perform a check after programming and it is written OK after test. I also checked reset line and it is not short with ground (there is only the small yellow cap). there is only Aref that is not linked to 5v I don't know if it is normal ? Also I'd like to check the quartz ? but I don't know how to test it and why it would have break ? If you can program the device, and the fuses are set to "external crystal" than the crystal should be OK. You cannot program without the chip having a clock. When you turn on, is the reset signal at 5V? I may have the fuses wrong. For some reason I thought you have put a ATMEGA128 on the board, so I gave you the fuses for that. Have you a ATMEGA64A in fact? I confirm I have 64A. It is better, it is written bad eprom data on the LCD, I don't know if I do flash the right way, I put .hex in flash and click Program. But I never put anything in EEPROM .hex in studio 4, is it ok ? Yes it is OK. 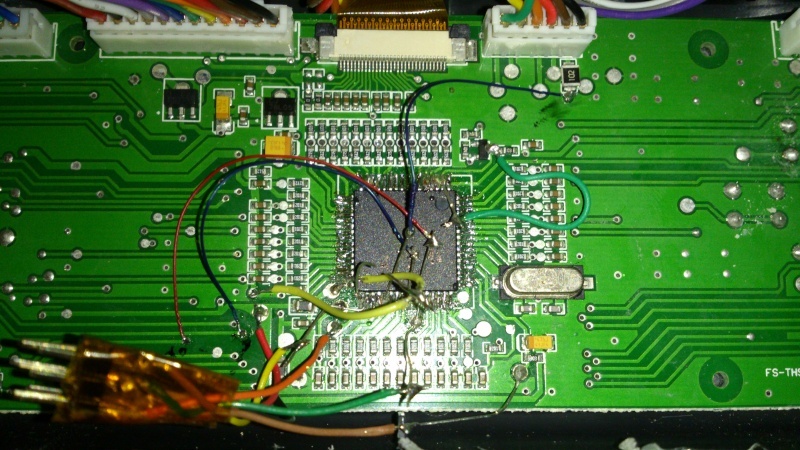 The first time after the first flash the EEPROM is blank, so er9x will report "bad EEPROM data". Just press a button and let er9x format the EEPROM. Then you should be running. First thing to do after that is to CALIBRATE the sticks and pots. Thanks very much Mike for your time my 9X seems to be working now, alls channels and switches seems to work, I'll try tomorow with HF module because I gave mine to a friend for his V911. Now, I'll read ER9x manual so I can program my quad and planes tomorow. Seems to be very powerfull compared to stock and I like general view a lot more than before. Welcome to the user group! You've passed the test. You hung in there and fixed your board. It only gets better from here and you've got the help to make it happen. Mike really knows his stuff. I also made bridges on some via on this side because I broke strips under the µc. Now I am doing epoxy poting on all that. quite long work but it works. Regarding er9x firmware, I confirm it is a great great improvement compared to stock firmware. Look up chip quick. Many like to use it instead of cutting the pins off. Maybe utube videos showing it in use. Good news you got it replaced and working. I've cut the pins. I work round the chip, but leave one pin in each corner initially to provide mechanical support. I then cut three of these and the last pin can be desoldered. I would like to ask support to you Mike also for my problem on Turnigy 9x. I already did experience flashing OpenTX on my 9X and 9XR. I bought a second 9X with same problem and did exactly the same with new processor. I can flash OpenTX and read models, no problem!. The problem is that LCD do not show anything at all. I also try to reset/protect fuse but nothing happen. For your info 5V volt regulator and 10micro capacitor are replaced, 3.3V looks ok. Resistors to LCD looks fine and also upper pins of processor to LCD resistors are ok (everything checked by microscope). Download the radio eeprom onto companion, and check that the contrast is not set too low.. 25 should.be a good starting value..
Hey, wait there a second, those fuses don't look right.. are those the fuses that companion programmed? I made the mistake of using my dremel grinder to cut the leads off. Went well until I discovered I had cut they one of the traces that runs under the processor. What to do? No easy way to add the wire externally without looking bad. My answer was to use the # 30 awg wire wrap wire. I stripped it and made it flat with my small needle nose pliers. So flat it that when I soldered if across the trace cut, the processor still was flush to the pc board. The new processor soldered in great, whew! I like mike’s solution better and I’ll do it his way next time. First time with chip quick but it did the job. The guy I fixed the 9x board for is still flying with it several years now. I believe I have one or several 9x pc boards that are in good shape. I kept them from sky ersky9x conversions. Also new 9x lcd displays and HK led backlight kits in white. I only have one 9xtreme 9x conversion left that uses the 9x main pc board and it’s working ok. The other (2) 9x conversions use a sky of board. I also have 1 or 2 brand new stick/gimbals sets I bought before I discovered how I could repair the 9x gimbal pots. Bought them but never used them. I saved them in case all the er9x telemetry conversions I did (free) for club members (6) failed, I’d have replacement parts to fix them. Here we are maybe 5 years later and they’re still working and several have left the USA. A tribute to erez (Erez Raviv) and Mike Blandford’s fw work! Please go to www.er9x.com, download and install eepe. Connect your radio to the computer using the programmer. Go to the "Burn" menu then select "Configure". Select your radio's processor (m128?? ), your programmer, and com port. Click ok.
Then go again to the "Burn" menu and select "Set fuses to protect eeprom" Click OK. wait until it finishes. Disconnect radio and programmer. See if your radio now works.. I will appreciate if someone can give me a link to purchase a spare LCD screen. Hobbyking has discountinued the product, Banggood never in stock and on ebay long delivery (I'm in Italy, so Europe for me is fine but I do not want to pay 40% of the radio value. For this reason also a different LCD is welcome if it can be fitted into 9x board. Anyhow, can you confirm to me the fuse to be used on a 9x board with atmega128 chip, just to be sure.